I had the pleasure of speaking at the Merwinsville Hotel Restoration Project meeting a couple of weeks ago. They are a group of avid library users who wanted to know more about our modernization plans. At one point, I said that our building facility, in comparison to surrounding libraries, is simply not a space people want to be in. One of the members said that, while she agrees with the need for modernization, she begged to differ with my statement. To paraphrase, she said, ‘The library is NOT just the building, it is the people who work inside it that make it a good library or not and NMPL is a GOOD library!’ She is right and I was very happy at the recognition of our wonderful staff, but the library is so much more than just the people or the building. As another patron pointed out to me last week, the library is a center of learning for everyone. The main reason why people come to the library or use it online is to learn something. Maybe they are a new parent and need advice, maybe they are buying a new dishwasher and need to know the best brand, maybe they need to know what is happening in their world so they must access Facebook or Instagram, and yes, maybe they need to find out if we have the latest Janet Evanovich title and put it on hold. In every case, they are looking for answers to questions and they look to us to provide the answers … because they know the internet might give them the wrong answer. All that said, the building facility is in dire need of modernization – 40 years is a long time to go without updating. I hope you have all come in to see the plans on display in the library and if you haven’t, we would love to show them to you. Our architects, Lothrop Associates, have been hard at work over the summer on the next phase of planning, Design and Development. This phase specifies the location of the nitty gritty, such as electrical, plumbing, etc., along with some small design changes. We invite you to see the result of all this work at the Modernization Committee meeting at the library in Tuesday, October 17th at 7:00 PM. On October 23rd, the architects will again present their work to the Town Council and the Modernization Committee will be asking for funding of the final phase of planning, the actual Construction Documents. 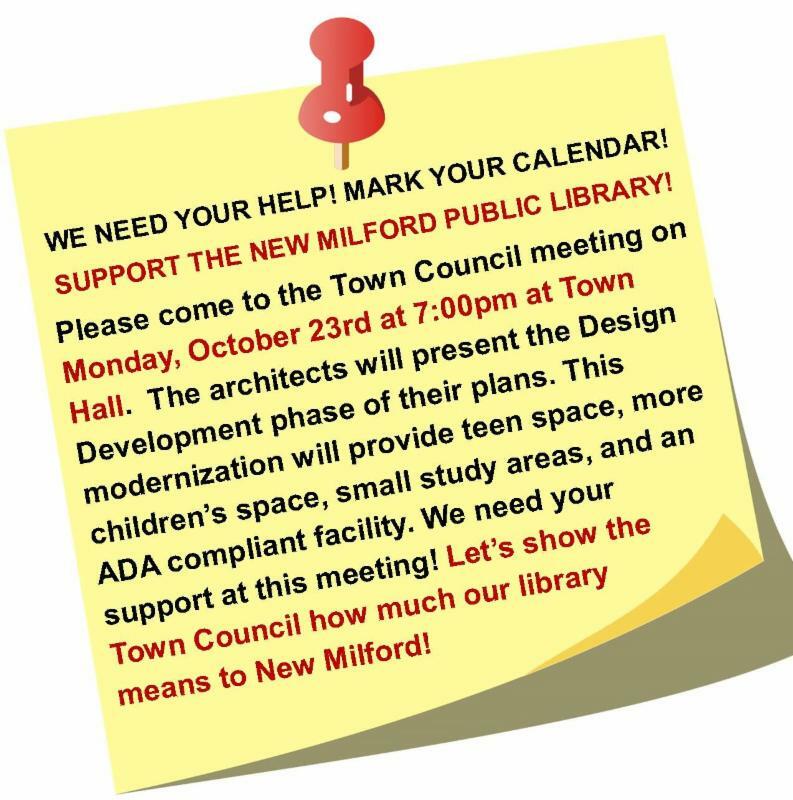 We will need you to support this request, either by your presence at the meeting or by emailing your comments to the Town Council members (towncouncil@newmilford.org). This is the closest we have come in our three attempts to modernize the library over the last twenty years – let’s not let it go by the wayside now!! We recently received the following announcement from Family Search. This new format will offer improved and more efficient access to all their records. We hope these new features will serve you well. Please let us know if you encounter any difficulties as you search for your family’s history! On September 1, 2017, FamilySearch discontinued its microfilm distribution services. This change is the result of significant progress made in FamilySearch’s microfilm digitization efforts and the obsolescence of microfilm technology. Online access to digital images allows FamilySearch and its affiliate libraries to reach more patrons faster and more efficiently. We will continue to provide access to our microfilm holdings already on loan from FamilySearch, while offering access to online copies as they become available. FamilySearch is a global leader in historic records preservation and access, with billions of the world’s genealogical records in its collections. It began the transition to digital preservation years ago, not only in converting its microfilm, but also in replacing its microfilm cameras with specialized digital equipment. FamilySearch has now digitally reproduced the bulk of its microfilm collection-over 1.5 billion images so far-including the most requested collections based on microfilm loan records worldwide. The remaining microfilms should be digitized by 2020, and all new records from its ongoing global efforts are already using digital camera equipment. Digital images of historical records can be accessed today in three places on FamilySearch.org under Search. Recordsincludes historical records indexed by name or organized with an image browse. Books includes digital copies of books from the Family History Library and other libraries. The Catalog includes a description of genealogical materials (including books, online materials, microfilm, microfiche, etc.) in the FamilySearch collection, including millions of online images not yet available in Records or Books. For navigation help, see Finding Digital Images on FamilySearch.org. Transitioning from microfilm to digital will enable more library patrons to access FamilySearch’s growing digital content and enjoy a simplified experience. FamilySearch will continue to offer access to records through the library, including new digital access to many of the records that are currently restricted from viewing at home. The last day for ordering microfilm was August 31, 2017. Now that microfilm ordering has ended, we will continue to maintain microfilm collections already on loan from FamilySearch, with the option to return microfilm that is available online or otherwise not being used by patrons, or to retain it for now. We may also retain microfilms that are not yet available digitally. For more information, see Digital Records Access Replacing Microfilm. 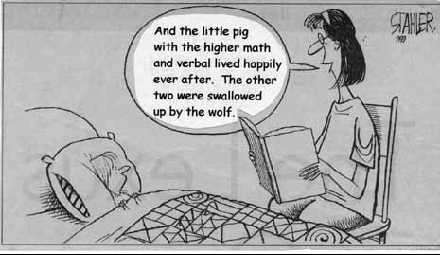 Don’t Get Swallowed By the Wolf! Practice for the SAT, ACT, GED, and nearly any other entry test at home! With an internet connection and a New Milford Public Library card, you have access to the most current tests that will help you get ready for college, for the nursing exam, for TOEFL, for the military, pretty much anything. Go to Learning Express to create a free account and get ready for the next stage of your life. And you can do it in your pajamas!! Can’t find what you want in the New Milford Library catalog? Can’t find it in the Bibliomation catalog either? 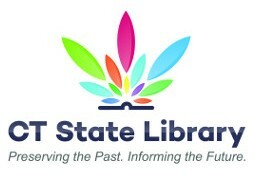 Well, now you can check the newly updated CT State Library! Just go to http://finditct.org/eg/opac/home and search for books and econtent as well. You’ve all heard of the domino effect? We are experiencing one in the library, and all because of one small idea! Many of you support the library by being generous buyers of the FRIENDS gently used books, located at the top of the ramp. That has never felt like a good location since it is cramped and in the middle of a ‘thoroughfare,’ but we simply couldn’t come up with anything better. However, we took another look and have come up with what we think will be a much better plan for the FRIENDS, as well as the library. It does involve a domino chain of changes, though, that we will be implementing in the beginning of November. Just so you have a heads up, we will publish this article now and again in November. Ready? The FRIENDS will have the entire area to the right of the front door as you face it. They have purchased several book cases and it will be a much more comfortable area for you to browse. The Display Cabinet will relocate to the bottom of the ramp next to the CT Room. The copier will relocate to beside the Catalog computer by the grandfather clock. The catalog computer will have a new computer stand with a smaller footprint (thanks to the FRIENDS!). The Teen Zone Graphic Novels will be relocated to the end of the Adult Fiction A-B row on a new cart that will have a display area (where the magazines are now). The magazine spinner rack will relocate to where the Foreign Fiction is, next to the new fiction and nonfiction bookshelves. And, lastly, the Foreign Fiction will be relocated next to the Foreign Films. Phew! It took the input of several people to work it all out, but it actually should make more sense. 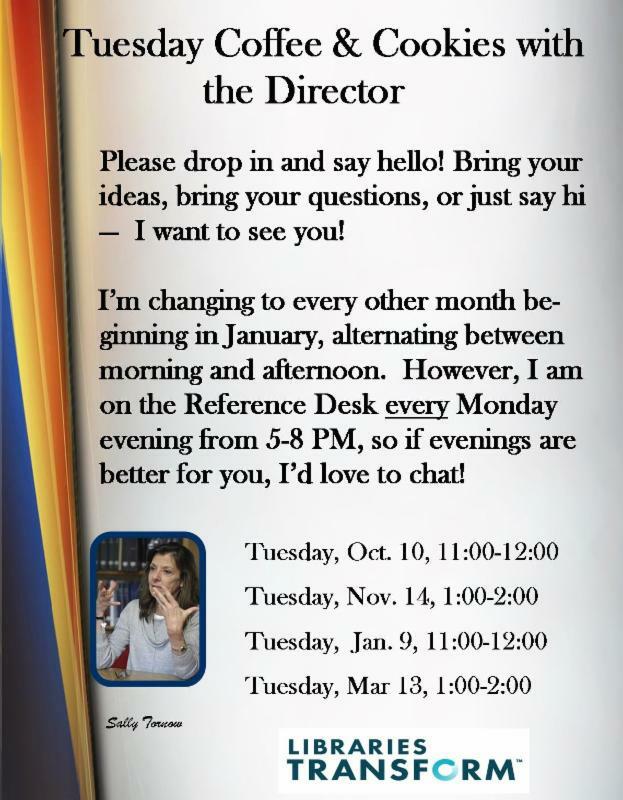 And, don’t worry, if you don’t remember, we’ll be happy to direct you! Thank you, New Milford Garden Club! New Milford has wonderful non-profit organizations that all make our town a better place. The library is always looking for ways to partner and develop relationships where none existed before. Last month, we asked the New Milford Garden Club if they might possibly be interested in taking us under their wing and they have so graciously said yes! Their considerable expertise will be shared with our Facilities Maintainer and they have even offered to plant some bulbs, as well as place one of their gorgeous arrangements on a monthly basis near the Circ desk. Thank you in particular to Jan Parsons, Gerry Hipp, and Ann Stone for giving so generously of their time and experience. 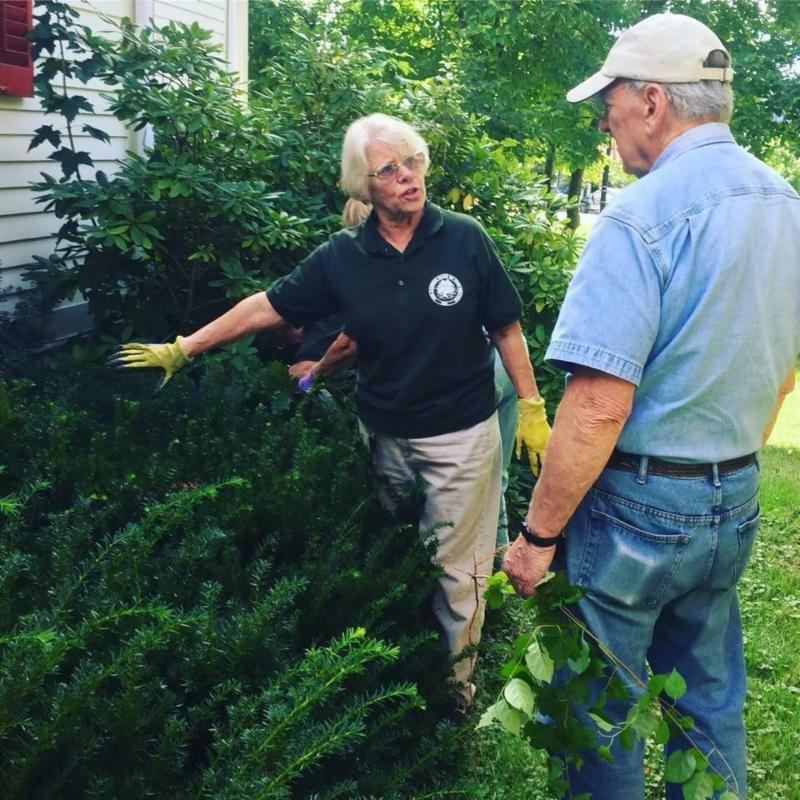 We, of course, are not the only recipient of their kindness – take a look at everything the Garden Club does! 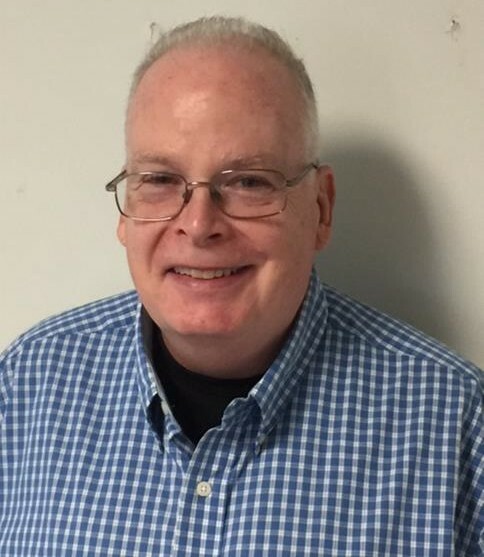 With degrees in both economics and psychology, Mike was hired as a computer operator for the NYPL. He then got a certification from NYU to be an Assembler programmer and worked in that capacity for two years at NYPL. Eventually, Mike was hired to work in the IT department at New York Life Insurance and stayed with the company for the next 35 years, first in Manhattan. He and Joan moved to Malverne, Long Island, and had six kids-three girls and three boys. In 2003, New York Life moved some of its operations to Sleepy Hollow, NY, and so the McManus family moved to Brookfield. Now, with his youngest twin girls in their junior years at college, Mike and Joan are thinking of downsizing. Mike retired four years ago from New York Life, then started here at the library as a digital literacy volunteer. And now we are so glad he is working at our reference desk. Mike’s favorite authors include Edith Wharton, Shirley Jackson, and Stephen King. His life philosophy is to just go with the flow. So, please feel free to stop on by and ask him anything, including any computer questions. Mike and all of us here at NMPL believe that libraries are for everybody-to learn anything from how to borrow e-books to how to knit a sweater!